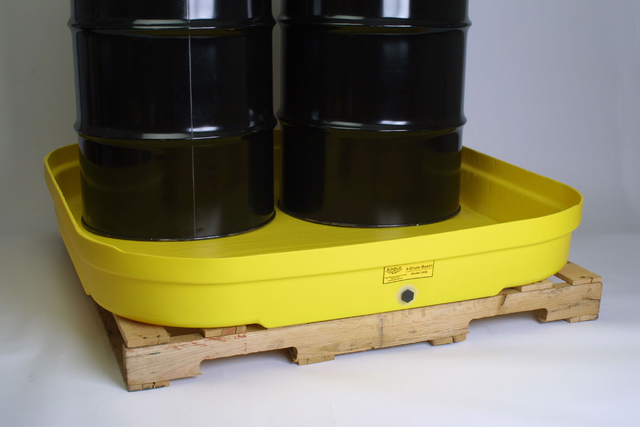 Economy Spill Pallets For Low Cost Spill Protection. New Flexible-side Spill Pallet Models are Durable and SAVE on Shipping Costs. 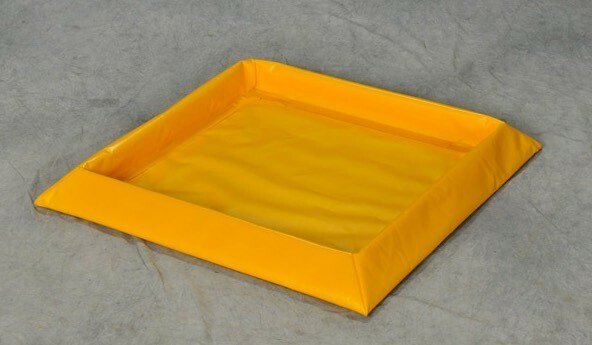 Our model of economy spill basins are hard polyethylene trays. They come without grates in one drum, two drum and four drum models. 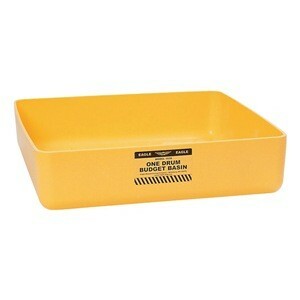 Because they are more like a tray, they have no grates and are light weight and very portable. Not only are they chemical resistant but they are also very durable. The basins are yellow in color. Our 4 drum model (A1638E) has external centering guides which keep the basin from slipping off the pallet if you chose to move drums on a pallet. Drums rest on the floor of the basin, transferring the load to the pallet. 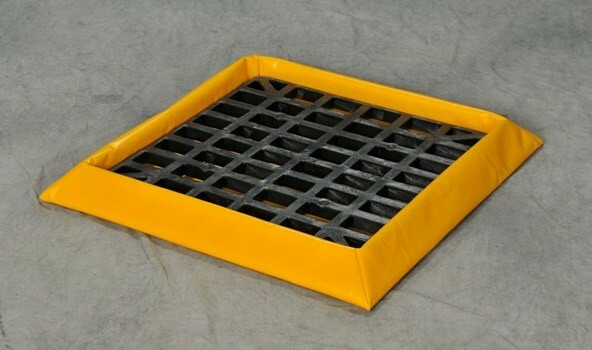 An alternative to hard polyurethane pallets is our NEW Flexible Spill Pallet Model. They look like a regular spill pallet but are made with a heavy duty, durable PVC fabric for easy movement and storage instead of hard high-density polyethylene. Most of our new flexible models ship UPS so you SAVE on shipping cost. Comes in 1 drum to 6 drum sizes with liquid capacities from 10 gallons to 45 gallons. Purchase with or without grates. Grates are made of HDPE material. Use for drums, parts or small equipment. Foam sidewalls means you can move items in or out using hand trucks or forklifts. No ramp is needed. It is easy to move and has light foam sidewalls that spring back to their original shape. You can even drive over it. Great for anytime you need temporary storage in a hurry. When done it can easily be folded and placed on a shelf. Have spring back foam walls and can be folded for storage when done. 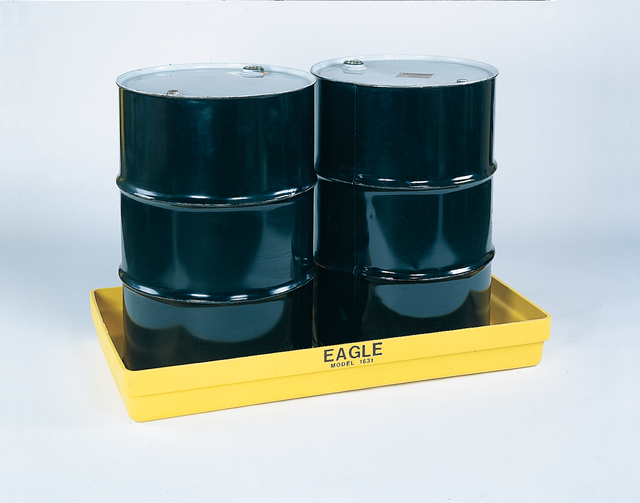 Our competition cannot beat our low pricing and customer service on spill pallets. Polyethylene construction Items A1631E and A1638E. PVC Fabric Flexible-sidewall Spill Pallets - Chemical Compatibility Guide. Dimensions, sump capacity, load capacity and weights for each pallet. noted below in Description. Wood pallets in picture not included. Optional grates for items as noted below. See Federal Regulatory Compliance Summaries here. Shop Absorbents Online for all your Spill Pallet Needs!